MADURAI: A glass-making unit functioned in Pasimedu near Palani in Dindigul district 2,000 years ago, according to the discovery by research scholars and historians, who have been excavating this site for the last two months. Speaking to TOI, K Rajan, head, department of History, Pondicherry University, said they had started excavation in the Porunthal village on the left bank of the Porunthal river, near Palani, under a project funded by the Central Institute of Classical Tamil and Archaeological Survey of India (ASI). They had made three trenches and collected over 2,000 glass beads. The beads are of various colours. A mound in this region called pasimedu' (mound of beads) was found to be covering an Iron Age' grave dating back to 500 B.C., that is 2,500 years ago. 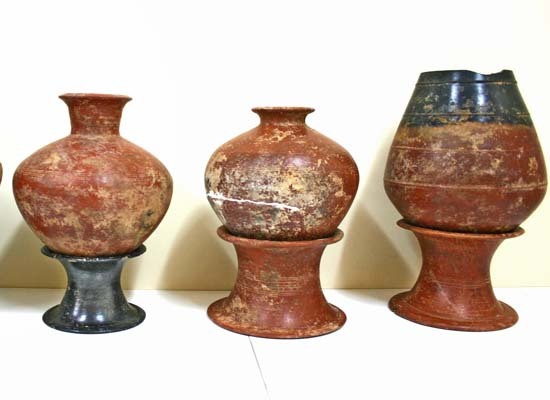 Their most priced discovery was that of a glass-making furnace, the first such discovery in Tamil Nadu, which dates back to the first century A.D. 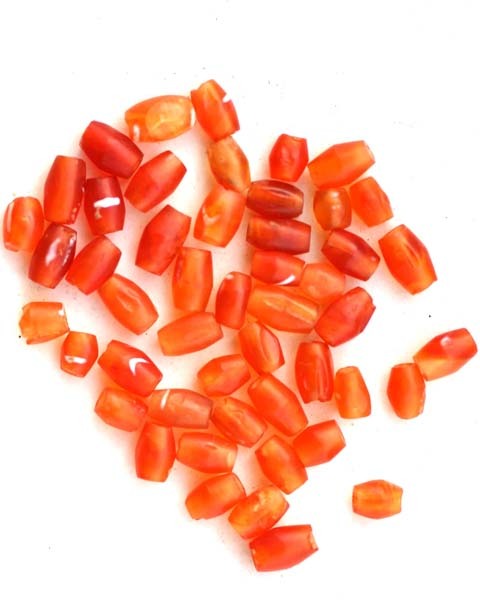 The grave contained skeletal remains from a secondary burial over a bed of about 3,000 beads belonging to varieties like steatite micro beads and etched carnelian beads and quartz beads, pendants and agate beads. Jars, conical vases and plates were also discovered in the grave that contained graffiti. They also discovered many antiques including terrocotta male figurines dating back to first century A.D. and a terrocotta humped bull belonging to the same period. The glass-making furnace contained 50 identical symmetrical bowls used for polishing the beads by placing them on sand and a triangular terrocotta piece used for polishing the beads by rubbing them was also found. The site lies very close to the ancient trade route between the Pandiya capital of Madurai and Chera capital of Vanji. Earlier, gold coins belonging to the Roman empire of the first century A.D. had been discovered in places along the route like Chinnakalayamuthur, Pollachi and Bhoothinatham. This passage is mentioned as Peruvazhi' (big route) in Sangam literature. Commercial trade had taken place through this route to Rome and Greece according to history. FINDS: The cist-burial with two chambers, port-hole, ring-stand, a four-legged jar and pots at Porunthal; the ring-stand with Tamil-Brahmi inscription; decorated carnelian beads. An Iron Age burial site found by archaeologists near Porunthal in Dindigul district . PALANI: A team of research scholars and students of archaeology have unearthed a glass bead-manufacturing unit and an Iron Age graveyard in two places around Porunthal. It is 12 km from here on the ancient east-west trade route, connecting Tamil Nadu with Kerala. The first excavation made on ‘paasi medu’ (bead mound), spread over an area of five hectares, has revealed the presence of a glass bead-manufacturing unit. 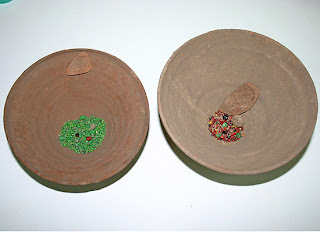 Thousands of beads in green, red, black, yellow, white, blue and maroon colours were unearthed from an area of 50 sq m, along with over 30 identical red ware bowls, triangular terracotta pieces and two furnaces. According to K. Rajan, Professor of Archaeology, Pondicherry University, who leads the excavation team, these “Indo-Pacific beads” could have been exported through Musiripattinam in Trichur district of Kerala, though there is no literary evidence to substantiate this claim. But the glass bead unit is the first of its kind in Tamil Nadu, he said. The beads found at Porunthal are waste products and the good ones would either have been used or exported. A brick wall found in the third trench at the site reveals the importance of Porunthal as a trade centre. The brick pattern followed in the wall, which in later years came to be referred to as “English bond,” is testimony to the technical skill of ancient people who lived in this region. 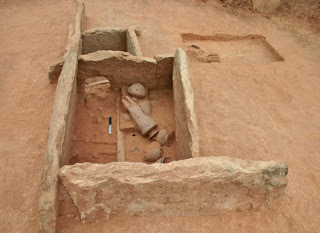 Other finds include an ivory dice, earrings, Sangam Age Chera square copper coin, hopscotches and a terracotta figurine. 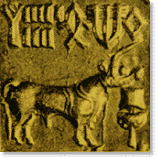 A figurine of a bull is another rare find. The terracotta figurine of a male, with a prominent face, broad shoulders and short legs, is dated 1st century AD. The team of research scholars and students from Pondicherry University, Tamil University, Mangalore University and Sri Venkateswara University found several Iron Age burials near the foothills of the Western Ghats abutting Chinna Gandhipuram. Each of these megalithic graves is encircled by boulders. These cist burials are of simple, according to V. Vedachalam, senior epigraphist. 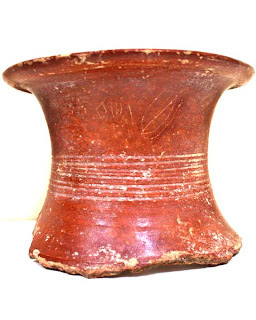 A burial with 12.5-metre diameter reveals the rich culture of the people of the region. The bicameral cist has two decks and two port holes. Its southern chamber yielded four-legged jars and pots of red polished ware, bowl of black and red ware and plates of black slipped ware. More than 3,000 beads of semi-precious stones were also recovered around the skeletal remains. The “grave goods” found in the cist suggest a kind of ritual performed by people, said Dr. Rajan. Porunthal, on the banks of the Porunthalar, is one among the 175 archaeological sites surveyed by V. P. Yatheeskumar, research scholar of Pondicherry University, in the Amaravathi valley. The excavation is conducted with support from Pondicherry University, under the guidance of J. A. K. Tareen, Vice-Chancellor, Central Institute of Classical Tamil and Archaeological Survey of India. Porunthal (77° 28’ 38” E; 10° 22’ 58” N), a tiny village discovered in June 2009, lies on the left bank of the river Porunthilaru at the foothill of the Western Ghat about 12 km southwest Palani. This site discovered by V.P Yathees Kumar in 2006.This historical village lies close to the major trade routes connecting Pandya capital Madurai on the south and Chera capital Vanji on the west. The site was excavated between May and June 2009. Historically, the village Porunthal was part of the territorial division known as Vaikavur nadu, named after the main village Vaikavur or Aviyur. This village was considered as part of present pilgrimage town Palani, the ancient Pothini. One of the famous Vel chieftains who ruled this region was Vel-Avi-k-ko-p-perum-pekan, who belongs to a clan group named Aviyar-kudi. The Sangam poet Porunthil Ilangiranar who hailed from this village composed a poem (Purananuru 53) in praise of Chera king Mantharal Cheral Irumporai, who believed to be issued inscribed coins with a title Kollipporai datable to 1st century AD. Among the Roman coin hoards that encountered in India, nearly 90% of coin hoards were unearthed in Chera country along trade routes. One such coin hoard, accounting to 63 gold coins, discovered at Kalaiyamuttur on the left bank of river Porunthilaru in 1856, about 8 km down the stream from the site Porunthal suggests its importance. 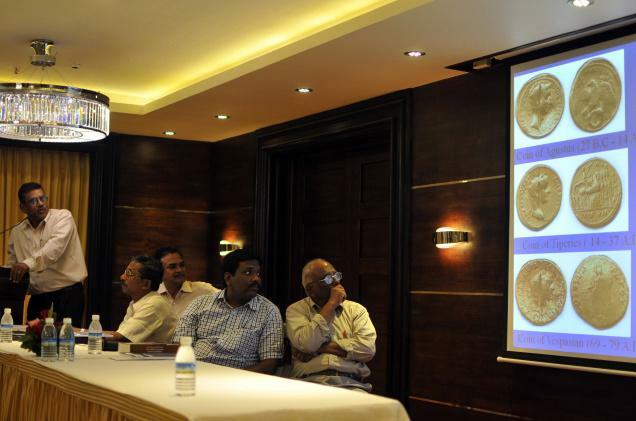 Other important archaeological sites that yielded Roman coin hoards in its vicinity were Budhinattam, Pollachi, Dharapuram and Karur. Historically important medieval trade guild inscriptions issued by the trade guilds Ainurruvar/Tisai-ayirattu-ainurruvar were located about 5 km from Porunthal down the stream at Tamaraikulam and Rajapuram. The Tamaraikulam and Rajapuram lies on the bank opposite to each other suggesting the east-west trade route that would have crossed the river at this point. The Rajapuram inscription refers to a gift made by Tisai-ayirattu-ainurruvar for the maintenance of the garden of a Siva temple located at Tamaraikulam. The Tamaraikulam trade guild inscription issued in 1192 AD during the 9th regnal of Parakesari Viracholan, a Kongu Chola refers to the trade guild Ainurruvar. The availability of early historical vestiges, coin hoards, trade guild inscriptions, graffiti marks, brick structures, etc., in the archaeological sites located in and around Porunthal clearly points the potentiality of the site. All archaeological vestiges like habitation mound, Iron Age burials, historical temples and inscriptions lie on the left bank of river Porunthilaru. The habitation mound covering an area of about 5.5 ha of elevated field locally called paci-medu meaning bead mound (paci > bead; medu > mound) lies south of Marutha-kali-amman-koil. In support of this name, innumerable beads and bangles made of glass and paste were collected on the surface. The site might have survived for a longer period of time as bead manufacturing centre as attested by the occurrence fragments of tuyere, slag and furnace material. A fragmentary inscription datable to 12th century AD noticed on the slab, placed as a part of door jam of the medieval temple Marutha-kali-amman-koil, mentions this village as Porunthal. Early Historic grave yard, consist of stone circles entombing cist numbering around 50, was noticed at the foothill near the present hamlets Chinnagandhipuram. Besides, such Iron Age graves were noticed in the vicinity of Porunthal in the places at Ravimangalam, Puliyamarattusettu. Periyaduraikombai and Salpulparai. The Excavation was conceived as multidisciplinary archaeological research with involvement of archaeologists, geologists, palaeo-botanists, epigraphists, numismatics, archaeo-zoologists and palaeontologists. These scholars cutting across multi-disciplinary spectrum were visited during the excavation. Besides, several scientific institutions and laboratories like French Institute of Pondicherry, Paddy Processing Research Institute, Chemical Laboratory of Madras Museum and Tamil Nadu Agricultural University were associated with the post-excavation analysis. In total, three trenches were laid one on southern part of the habitation mound and the remaining two at the central part. The two trenches were laid adjacent to each other in east-west orientation yielded similar cultural deposit. The material recovered from 250 cm cultural deposit suggests to a tentative date of 1st century BC and 3rd century AD. On the surface of the floor, several antiquities like glass and paste beads, glass bangles, pendent, copper bell, terracotta ear lopes, hopscotch, terracotta weight, gamesmen, stopper, spout, glass slag, bones, brick pieces, stone pebbles, gold pendent, ivory weight, etc., were recovered. An oval shaped glass polishing furnace, with hearth side wall intact, was exposed almost at the centre of the floor with 60 glass beads. Two holes probably used for placing the bellow and a flat stone used by the glass-smith and several identical red ware bowls with wide mouth and narrow bottom were noticed in association with furnace. These bowls, placed around the furnace, might have been used in the workshop to keep the glass beads in heated condition. 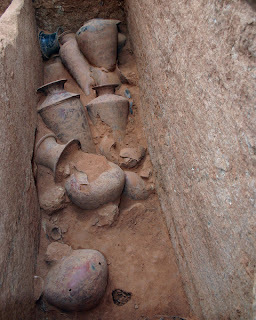 Several triangular terracotta pieces were recovered in association with these bowls. These terracotta pieces might have used to polish the glass surface. The non-availability of glass slag, raw material for producing beads, tyueres and waste material clearly points to the fact this furnace might have restricted to the use of polishing the glass beads. Several hundreds of glass beads were encountered above this floor. Quite interestingly, the regular household pots used in the day to day domestic life were missing. All the pots recovered from these two trenches points to industrial activity rather than domestic activity. The occurrence of more than 2000 beads also supports this view. Human terracotta figurine, gold piece, copper coin, terracotta humped bull, a terracotta female head and several pots and bowls were recovered. Besides, charred grains like paddy and seeds of tamarind were recovered at this stage. The important antiquities recovered from these trenches were beads made of glass, paste, quartz, shell, garnet and terracotta. Bangle pieces came from glass and shell. The terracotta objects like ear lobes, ear rings, games men, hook, hopscotch, spindle whorl, ball and cart-wheel are some of the interesting objects recovered from these cuttings. In case of metal objects iron arrow heads, knives and nails were collected sparingly. Likewise a copper ring and a bell were also collected. Two pendants one made gold and another of glass were also unearthed. Among the weights (presumably), made of quartz and ivory, were of note worthy. The well-modelled human (male?) 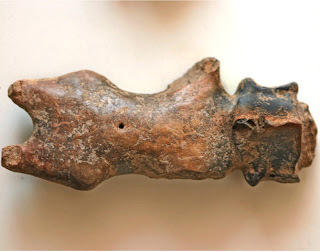 figurine with prominent human facial feature made out of pinching method has elongated body, broad shoulder and short legs, all suggestive of archaic figure generally dated to 1st century AD. Such unique terracotta figurines were not reported elsewhere in Tamil Nadu. In addition to these figurines, three torso figurines were recovered. Besides, a female head was recovered. The head with curling hairs was shown with prominent elongated ear. Near to these figurines, a square (Sangam Age ?) copper coin was also recovered. A brick structure was exposed on the north-eastern corner of the third trench. The brick wall with five courses was raised over a base made of 20 cm thick clay foundation. The bricks were laid using the English bond method. The size of the brick is 7x21x42 cm and 8x24x48 cm in the ratio of 1:3:6 cm. The stretcher and header method was adapted alternatively. ¨ Glass manufacturing activities are more at lower levels when compare with the upper levels. 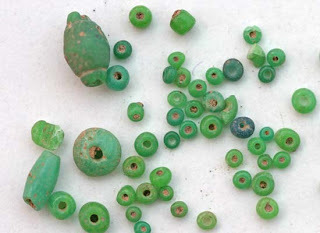 ¨ Green beads were manufactured in larger quantities in early period and paste red beads in later periods. ¨ The occurrence of terracotta human figurines suggests their external contact. ¨ Though they were involved with the mass production of glass beads, their external trade contact was kept at minimal level. They might have involved in the manufacturing of beads rather than marketing. 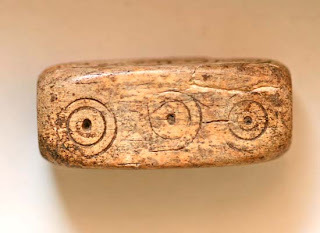 Marketing of these beads would have taken place at some other marketing sites, probably located along the trade routes. The graveyard covering an area of 2 ha lies at the eastern side of the foothill of Tannasiyappanmalai. Among the graves, the one found in the cultivated field near to the main road was selected for excavation. The east facing transepted cist with passage on the east was placed almost at the centre of the circle. Grave goods were placed inside the northern and southern chambers and in the passage. Besides, grave goods were also noticed outside the chamber but mostly within the circle. Grave goods were placed at two levels. The first level of grave goods was noticed on the floor slab and the second level of grave goods was noticed at the porthole level. In case of northern chamber, almost all the grave goods except a pot were placed at the floor level. In case of southern chamber, the grave goods were placed at the floor level in all the three compartments/partitions but in a limited quantity. However, several grave goods were placed on the bench slab at the second level. The ritual performed in this grave was of high standard. Both the northern and southern chambers were met with several pots like four legged jars, plates, ring stands, bowls, miniature bowls and antiquities like stirrups, beads, arrow heads, skeletal remains, swords, pots and knife. One of the legged jars carried the paddy, close to 2 kg, in comparatively better state of preservation. All the above grave goods were packed in a limited area on the western most part of the northern chamber. Next to this, on its east, the most important ring stand was noticed. This red slipped ring stand was placed in a vertical position on the floor slab. Around this 22 etched carnelian was placed. 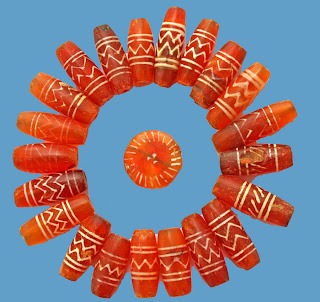 Of these 22 beads, two were button-shaped and remaining 20 beads were barrel in shape. Further, 4 more etched carnelian beads, a small sword and an arrow head were placed inside the ring stand. The tip of the sword and the arrow head were placed pointing upward. Of the 4 beads, one is a button-shaped but broken. An iron sword, in east-west orientation with tip on its west, was placed on the northern side of the above ring stand. The sword was placed close to northern orthostat. One of the important points to be observed is that all the ring stands that placed in this grave were made fresh and interned as grave good but the ring stand under discussion was a used one, probably, belonged to the deceased one. On his death, this would have brought and placed in the chamber and some important ritual might have performed. Above all, the ring stand under discussion had five post-firing graffiti marks engraved on the exterior surface of the shoulder portion of the ring stand. Four marks engraved on one side and the remaining one was on the opposite side. The four marks were placed facing west and the remaining solitary graffito on its opposite facing east. Of the four graffiti marks, three graffiti marks were Tamil-Brahmi scripts reading va-y-ra. These were smaller in size when compare with the fourth graffiti engraved next to these three scripts. The last symbol is identical to the one, both in size and shape that were found in most of the pots placed as grave goods in this grave. The fifth symbol engraved on the opposite side of the ring stand was identical to the fourth symbol. The Tamil-Brahmi script, graffiti marks, carnelian beads, an iron sword and an arrow head found in association with ring stand clearly points to the importance given by them. 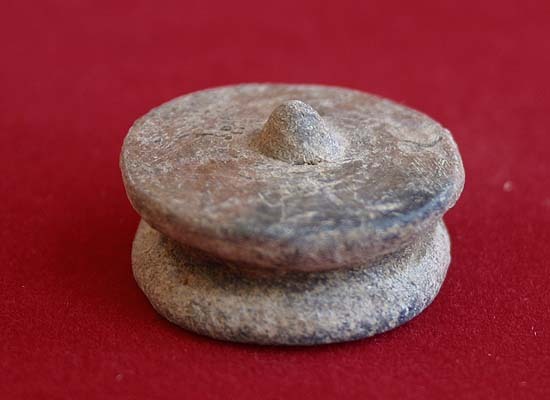 This ring stand, as said above, was placed close to human bone pieces placed over the broken legged jar and in the ring stand. The contextual position of the ring stand clearly points to its importance. Near to the orthostat, two long iron swords with a bunch of arrow heads close to its tip portion were observed. Besides, three set of iron stirrups were placed. Over these iron objects, bone pieces were placed in a black and red ware plate. 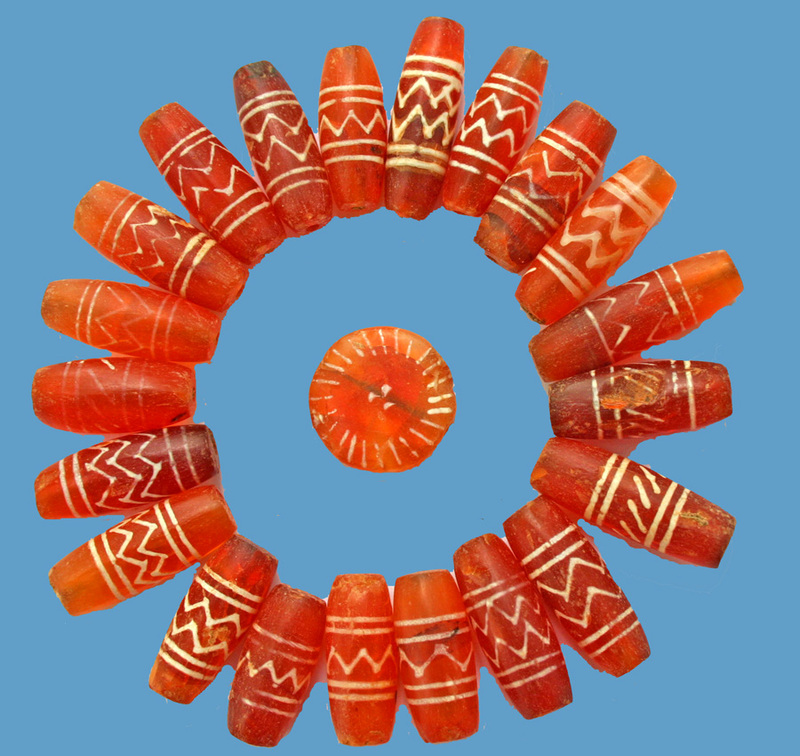 In total, this chamber yielded beads of etched carnelian, agate, quartz and steatite totalling more than 8000 beads. Besides, Ph.D scholars, M.Phil and Postgraduate students from Mangalore University, Sri.Venkateswara University, Tamil University and Pondicherry University actively participated and got trained in the explorations and excavation techniques. The several scholars cutting across disciplines visited the site during the excavations and rendered valuable academic input for the better understanding of the site.